The Japanese have a knack for special effects, especially when it comes to CGI and Vexille truly pushes the boundaries of traditional anime. 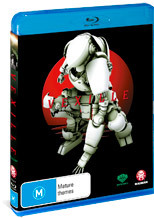 Set in 2077, the story revolves around Vexille, an elite warrior of SWORD who has been given the task of breaching the borders of Japan who have broken away from the United Nations and to make matters worse, they have erected an electromagnetic shield around their islands. Fortunately for Vexille, she is not alone and together with her elite group of warriors, they will soon discover that Japan is involved in all sorts of strange and bizarre experiments. Without spoiling the story and suffice to say, Vexille is a very well written story that although is steeped in action, has a brilliant and understandable plot. The main conflict for Vexille revolves around her being separated from her SWORD partner and of course, the secrets that she uncovers in Japan which plays not only on your thoughts but also her emotions. The star of the movie (besides the story and the characters) is the animation techniques employed in this film which look spectacular from character design to background environments that even puts some video games to shame. Director Sori definitely manages to successfully create an animated blockbuster, thanks to his varied experience and even though the characters don’t exist, you will immediately feel a link between them that makes watching this film a true treat. Of course to compliment the visually stunning animation, on Blu-ray, the video quality looks amazing with pure HD quality and if you don’t own a 1080p Digital TV, than you’re really doing this movie an injustice. Add in not only one but two True HD 5.1 mixes which include both the English and original Japanese version and Vexille comes together like a modern work of art. Thankfully it doesn’t end with just the film and there are a variety of special features to add to the entire experience from the motivations of the creators to how the film was made. I’ve been a fan of anime for a long-time and just like Western movies, every now and then, a new movie will come your way that breaks all norms of this genre and Vexille is that movie. For a movie that is purely CGI, it’s amazing how human it is at times. Recommended!